Who should read "Winning Opportunities" ? With the “set-your-own-price after reading” model, I gamble on readers’ fairness. If I am right, this bold distribution model represents a significant threat for traditional book publishers. By challenging publishers’ business model, this direct approach could encourage other authors to circumvent them too. 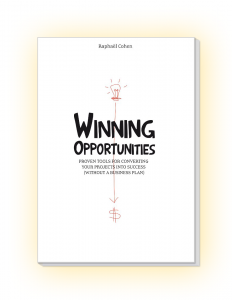 Simply: the book can be downloaded free of charge at www.winning-opportunities.org. Readers decide, after reading the book, what it is worth for them and so pay what they can afford. 10% of what readers pay for this book goes to support entrepreneurship education as well as job creation. I wrote the book in Geneva, Switzerland, and in many airplanes/trains, on the go. Since English is not my mother tongue, I have asked a British expert proofreader located in the South of France to make the appropriate corrections. The cover page was designed in Montreal. The book layout was made in Australia. The Kindle and iPad/ePub versions were converted in India. The website was designed in Serbia and the hardcopy publisher is located in the USA. In other words this simple book, a 200-page guide to seizing opportunities -jokes included-, mobilized resources on 4 of the 5 continents, all managed remotely from tiny Switzerland. Humor is a key component of my life. My lectures and training sessions are always filled with hilarious videos that help the audience remember what is being discussed. I even moderate a joke distribution list where subscribers receive free of charge funny videos and jokes (people can subscribe on www.supercohen.com). So many enthusiastic testimonials have come in from people who have used the IpOp Model for launching a new initiative, promoting an intrapreneurial project or creating a start-up, that there is no doubt about the impact that the IpOp Model has had on their career. A large majority of the participants who have attended my training sessions in large corporations have been promoted. Why? Because the model helped them demonstrate their ability to innovate and act as change agents. The executive education programs exploiting the IpOp Model have delivered a measurable return on investment for the companies and organizations that have implemented them (from multinational corporations to hospitals). Since such training brings in more money than its cost, it means that education is no longer a cost but a profit center. Many examples are available to show the impact that the IpOp Model has had on boosting innovation in diverse organizations. The content of this book encapsulates some of the key messages I have been teaching in corporate environments since 2001. After ten years of positive feedback, concrete results and repeat clients there is no doubt that the IpOp Model delivers results. Companies like Nestlé, Oracle, Microsoft, sanofi-aventis, Orange, Deutsche Telecom, PARC (Xerox) as well as banks or public sector organizations are convinced users. Also presented in this book are the five pillars of Management by Opportunity. By effectively outlining ways to successfully promote intrapreneurial behavior and mindsets within an organization, it enables executives in any organization to boost its innovation capabilities. Ultimately, Management by Opportunity empowers employees to become proactive change agents who bring real competitive advantages to their employer while increasing their level of engagement to the company. My experience is that it fits Generation Y’s expectations. The book proposes an alternative to business plans. Before “Winning Opportunities” and its earlier French version “Concevoir et lancer un projet”, there was apparently no alternative to convince decision-makers. Business plans were the “least bad” option to sell an opportunity. The business plan is an excellent corporate tool for converting a strategic analysis into an action plan. In addition, it is a very good vehicle to teach entrepreneurship. But this does not make it the appropriate instrument to analyze an opportunity or to convince decision-makers. The two-step approach, Opportunity Case followed by an Implementation Plan, as explained in “Winning Opportunities, proven tools for converting your projects into success (without a business plan)” might become the next best practice for convincing decision-makers, replacing the traditional (and painful) business plan. It is based on the investors’ mental decision tree presented in the book. The Opportunity Case is now used by organizations as their standard decision-making process to more rigorously allocate resources to projects or new initiatives, regardless of their innovation content. The Geneva University Hospitals have, for instance, already implemented a customized version of this mechanism. People in charge of licensing and technology transfer who must assess the benefits of a new discovery before deciding to patent or license it. Anyone with a sense of humor (although there is no obligation to read the jokes!). This book finally gives innovators an alternative to the painful writing of business plans. Not only an alternative but also a more effective, faster and easier way to convince investors and decision makers: the Opportunity Case is a more user-friendly way of analyzing and presenting a project, which has been quickly adopted by those who have been exposed to it. It also addresses a central problem in existing businesses: many people have good ideas but very few of these innovations are actually implemented. The content of this book proposes the first practical process that has been demonstrated to boost innovation by up to 56%. “Winning Opportunities” presents the IpOp Model, which models, in a very concrete and down-to-earth way, the core process of innovation that successful entrepreneurs and intrapreneurs use, even unconsciously. The model acts as a simple hands-on roadmap for innovators who want to increase their chances of success. The book contains a large number of real-life examples that are also a source of inspiration to the readers. Besides helping start-up initiators, the IpOp Model improves and complements the existing innovation selection process used by large organizations (staged gate, six sigma, etc.). The IpOp Model may become a best practice for innovation to the same extent that the “six sigma” model has become a best practice for quality improvement. Geneva, Switzerland, 11 July 2011-- Today’s web launch of “Winning Opportunities, proven tools for converting your projects into success (without a business plan)” gives innovators an energizing, witty guide with an established alternative to writing a business plan, more effective at convincing investors and decision-makers. It is the first use of the new “set-your-own-price” business model applied to a management book. . The reader can download (www.winning-opportunities.org) and read the book free of charge before deciding what s/he wants to pay; 10% of the payment goes to support job creation and entrepreneurship education worldwide (www.winning-opportunities.org/whowesupport) The “set-your-own-price” formula was pioneered by other industries, including music (e.g. Radiohead’s album, In Rainbows), restaurants and hotels. Prof. Raphael H. Cohen states “I trust readers. They will pay what they can afford, according to what they think “Winning Opportunities” is worth for them and their future”. In this book, the rigorous IpOp Model, which describes the intuitive core process of innovation behind successful entrepreneurs and intrapreneurs, is presented. This structured and user-friendly roadmap helps innovators turn an idea into a tangible opportunity, outline measurable deliverables, learn how to address all the key issues critical to the success of their project, and identify early in the process whether an opportunity is worth pursuing. To illustrate its concepts, a large number of real-life examples are included as inspiration to the reader. Nespresso’s strategy is used throughout the book to demonstrate each key step of the IpOp Model. It is the first description of the strategy that shaped the fascinating success story of Nespresso, a $3-billion business with double-digit annual growth. Both Nespresso and IpOp Model were developed in Switzerland, recently ranked No 1 in innovation worldwide. illustrating its serious content. This witty business book delivers invaluable lessons without being dry or boring. The IpOp Model analysis complements and brings improvement to various existing selection processes available to decision-makers, such as stage gate or six sigma. Capitalizing on the comprehensive Decision Tree – as identified and described by the author – the IpOp Model enables decision makers to allocate resources to projects more efficiently, thereby increasing their return on investment. Its application is not restricted to innovation; it is relevant to any project or request for resources. The IpOp Model has been successfully used by multinational corporations like Nestlé, Microsoft, Oracle, sanofi-aventis, banks and industrial companies, as well as by startups and hospitals. Author Professor Raphael H Cohen, Ph. D. is a successful serial entrepreneur. He teaches innovation in business schools and customized executive education programs, and is academic director of the entrepreneurship specialization of the MBA of the University of Geneva, Switzerland. 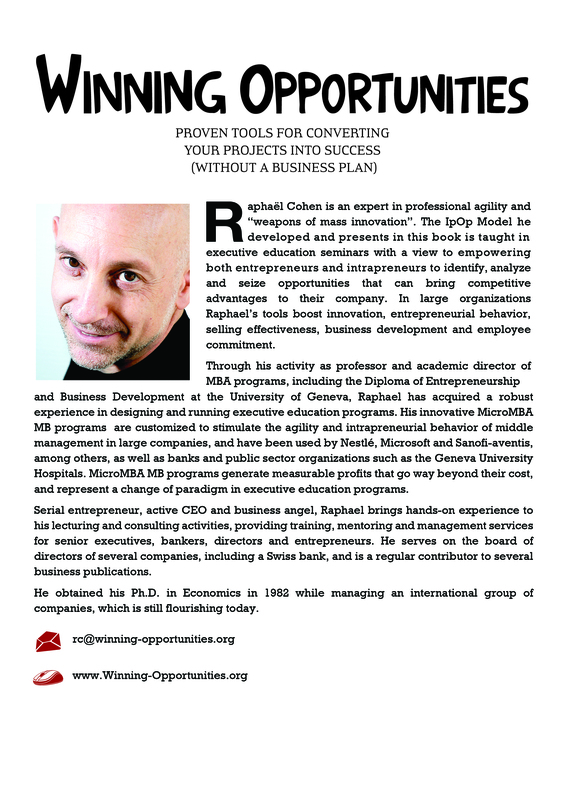 Raphaël Cohen is an expert in professional agility and “weapons of mass innovation”. 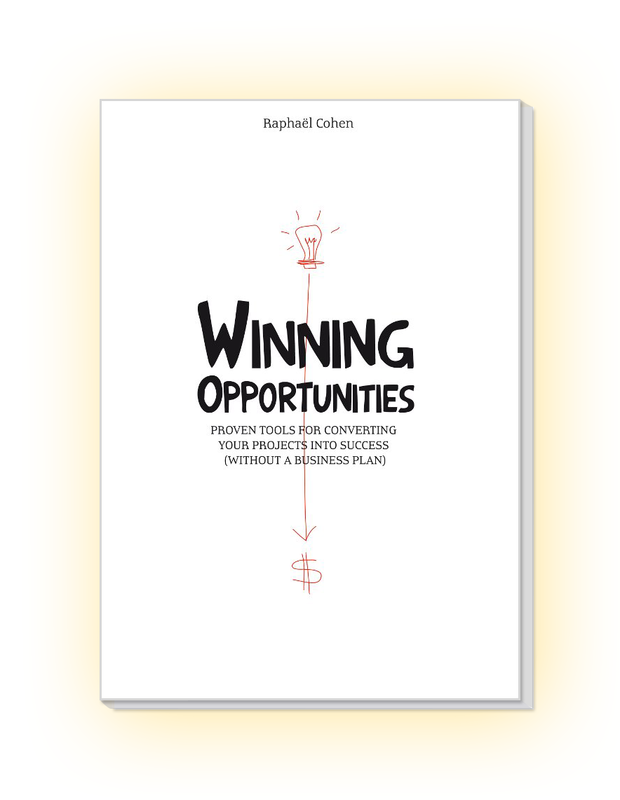 He has conceptualized the IpOp Model, which is presented in his latest book “Winning Opportunities, proven tools for converting your projects into success… without a business plan” (downloadable on www.winning-opportunities.org). The French version “Concevoir et lancer un projet” was published in 2006. The IpOp Model, taught in executive education seminars, empowers entrepreneurs as well as intrapreneurs to identify, analyze and seize opportunities that bring competitive advantages to their company. In large organizations, Raphael’s tools boost innovation, entrepreneurial behavior, selling effectiveness, business development as well as employees’ commitment. 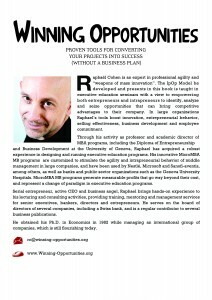 Raphael also designed and runs MicroMBA MB executive education programs customized to stimulate the agility and intrapreneurial behavior of middle management in large companies such as Nestlé, Microsoft, Sanofi-aventis, banks as well as public sector organizations such as the Geneva University Hospitals. Because MicroMBAs MB generate measurable profits exceeding their cost, they represent a change of paradigm in executive education programs. MicroMBAs MB are the corporate version of the first four CREATE courses of Entrepreneurship for engineers and scientists in Switzerland (at both University of Geneva and EPFL, the Swiss Federal Institute of Technology) that Raphael designed and ran until 2002. He is currently the Academic Director of the Entrepreneurship and Business Development specialization Executive MBA of the University of Geneva (postgraduate Diploma of Executive Education), which he launched in 2001. He has also been the MBA European Academic Program Director of the Thunderbird School of Global Management (Phoenix, Arizona), where he holds the title of clinical professor. As serial entrepreneur, active CEO and business angel, Raphael brings his hands-on experience to his lecturing and consulting activities providing training, mentoring and management services to senior executives, bankers, directors and entrepreneurs. Raphael serves on the board of directors of several companies, including one Swiss bank, and is a regular contributor to several business publications. He obtained his Ph.D. in Economics in 1982 while managing an international group of companies, which he still directs. His diversified working experience on 3 continents and in many industries led him to develop expertise in innovation, leadership, strategic analysis and business development, management, negotiation, sales, HR, coaching and mentoring, financial engineering, legal affairs (international taxation, licensing, real estate, M&A, etc. ), asset management, turning-around businesses, interim and crisis management.